GDPR makes major changes to all of Europe’s privacy laws and has serious implications for companies both inside and outside the EU. Regardless of where your company is located, if you collect and/or process the personal data of any individual living and working within the EU you will be subject to the new regulation. This concept is of particular interest and confusion to organizations who rely on current and potential customer data for their sales and marketing efforts. In many circumstances it is difficult and or prohibitively expensive to actually obtain consent that meets the criteria of clear, affirmative, freely given, etc. Therefore, it may be tempting for organizations to attempt to justify their processing of personal data as a “legitimate interest,” thereby doing an end run around the consent requirement. In the case of software and IP developers who control the legitimate use of their products via license compliance programs, there may be a compelling reason to collect and process the data of those who download the IP, agree to the licensing terms, and use the product. License compliance programs may monitor usage to ensure that the IP is being used legitimately and under the license agreement terms. Unauthorized use and use of counterfeit licenses is illegal and any data collected on illegal use may be important for protecting the rights of the IP owner, as well as for protecting the rights of legitimate licensees from unfair competition in the marketplace. The legitimate interests of the software and IP companies (data controller) could likely in this instance override the rights of individuals who are using the products illegally. 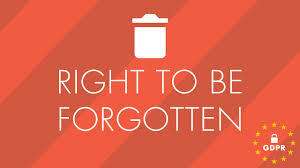 Moreover, the unauthorized users would arguably not have the RTBF in cases where the personal data may be legal evidence in a copyright infringement or breach of contract case. For more information on how SmartFlow license compliance management software can help users comply with GDPR personal data collection issues, visit https://www.smartflowcompliance.com/press-releases/smartflow-enterprise-2017-configurable-data-collection-functionality-enables-compliance-with-gdpr.